Really great cartridge. I have one in the Alaskan and my wife has the guide gun model, we both shoot the 300GR North Fork SS bonded and they are DEADLY. I definitely think you need a new gun specific to Nilgai. It's obvious that none of your rifles will be adequate. Y'all may convince me to buy a dang 300 mag yet. You guys are a bad influence on me and my wife hates y'all. Just made a deal on a 300 win mag out of our classifieds here on TBH. Dang Nilgais don't stand a chance now. Have killed 2 and used 30-378 165 grain tsx bullet, did the job. Not mine but sounds like a good deal. I loaded up some 180 grainers in 30.06 for a friend who killed a Nilgai with them. So I came across a good deal on a ruger hawkeye ftw in 7 rem mag. So now I need to find some good bullets to shoot out of the 1-9.5 twist. whats the green screens opinion on shooting one with a well loaded 45-70? Always thought a 416 would be awesome on them. One trip down one of the King Ranch guides said a guy came down every year and hunted with one. The said it was a smackdown. 30-06 worked great for each and knocked it down first shot. Shoot right up the shoulder. Shot was 215 yards on Norias at King Ranch and on top of a sand dune shooting down into an oak Mott. I use 165 grain Barnes triple shock since it's the most accurate for me. Definitely not the most knock down power in a bullet but works for me. I also had the lightest gun in our group. since I have one in the safe, I would pull out my 338 win mag, load it with 225 grain nosler partitions and go to town. But that is Just me. I am sure anything 7MM and above would work, and anything .30 cal and above would work better. I’ll be taking my 338 Lapua when I get the chance to whack one. I’m surprised at how little that caliber has been mentioned in this thread. then, i'll say again shoot a good bullet designed to penetrate and you'll be fine. i have a 7mm-08 that i love. Nosler accubonds will punch out both shoulders of most things. just use a good bullet for pass through since their heart and lungs are pushed farther up in the chest cavity. nosler accubond, barnes tsx, etc. caliber can be pretty much anything above a .243. There’s several in every crowd... A coworker on the King did kill them with a .243 but the man also took less then 75yds shots. That being said he sure didn’t recommend hunters to try it. .30-.378 with 180 grain Barnes TSX is bad medicine for nilgai. Probably don't want to build one too light. Any .300 magnum will work with a good bullet; however, my next one will succumb to a .416. The finger of God, guided too doctors that had matching weatherbys in .30-378 and nothing was safe inside 550yds with those guys. Any caliber that will effectively kill a whitetail will kill a Nilgai. I'd use a 7mm-08 or a .25-06. A heavier bullet or more energy isn't going to put one down that's hit in the muscle. Very tight and low on a broadside shot. Slightly quartering away is ideal, more so you don't have to blow up the delicious shoulder with a well placed broadside shot. Muscle isn’t what we’re worried about, it’s the thick bone behind that muscle. Like has been said, anchoring the bull where he won’t run into something you can’t drag him out of short of a dozer making a path for you is key. And if you hit them with one well made bullet that will break the shoulder blade and take out the heart and lungs it’ll save said meat. There is a huge difference in the ways those two bullets will react when shot out of those two different rifles. 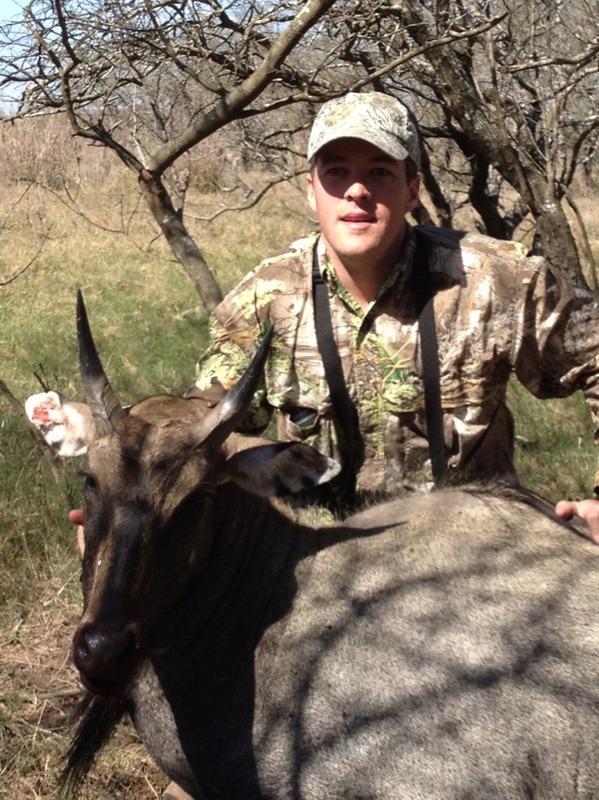 I have never shot a Nilgai but I have shot a few big animals in Africa. when I am hunting Big tough animals I want big holes and as much possibility for and exit as possible. Yes shot placement is key to any kill but are you willing to pass on a shot just because the bull is not standing perfect broadside at 100 yards or do you want a proven BIG GAME cartridge that can cleanly take BIG GAME animal when you fudge a shot or the animal is in a not so desirable position. All the comments about taking them with any cartridge that will take a deer are correct (mostly), I for one am not willing to chance it. If you want to step up to the big leagues and hunt big animals use the correct cartridge/bullet combination and get after it. One the .300, 338 and .30-06 I’d use the 180gr, it’ll shoot flat enough out too 250yds if you change your sighting in from 100 yds to zero at 200. It’ll be a little high at hundred but not much for hunting. I built a .338-06 ai for just such an occasion!